Tired of the same old beige box? Looking for something different? Take a step into the future with BOLData's unique, small form factor, all-in-one PC offerings. 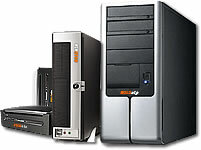 Choose from our complete line of all in one LCD PC, SFF and Mini PC solutions. Utilizing the latest Intel and AMD processors, these extraordinary systems take us to a new era in personal computing.